FOUNTAIN VALLEY, Calif., Dec. 13, 2018 — Pedego® Electric Bikes, the Number 1 electric bike brand in the United States, has announced the winners of its “Top Dealers” awards for 2018 at its 10th Annual Pedego Dealer Meeting held December 2–4, 2018, in Newport Beach, Calif. More than 200 Pedego professionals attended the event, representing Pedego’s 140 stores worldwide. Pedego Irvine (California) was named U.S. Dealer of the Year. 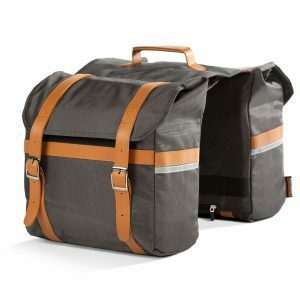 Pedego Canada was named Distributor of the Year. “We’re proud to recognize the recipients of the 2018 Top Pedego Dealer Awards for their achievements in going more than the extra mile to delight our customers with exceptional sales and customer service,” said Pedego Electric Bikes CEO and co-founder Don DiCostanzo. Bob, Yolanda and Shane Bibee of Pedego Irvine accept the 2018 U.S. Store of the Year Award from Pedego CFO Terry Sherry (left) and CEO Don DiCostanzo (right). Mike Clyde of Pedego Canada accepts the 2018 Distributor of the Year Award from Pedego CFO Terry Sherry (left) and CEO Don DiCostanzo (right). Awards were selected in 12 categories that ranged from top-selling stores to recognition of quality stores. Designations for the types of Pedego dealers include single-store owners, operators (multiple-store owners) and distributors. 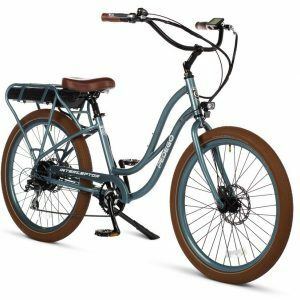 “This year’s Pedego Dealer Award winners have shared the joys of Pedego bikes, delivering success far beyond our expectations,” DiCostanzo added. Mike Clyde (right), owner of Pedego Canada, accepts his Distributor of the Year award from Pedego co-founders Don DiCostanzo (left) and Terry Sherry. 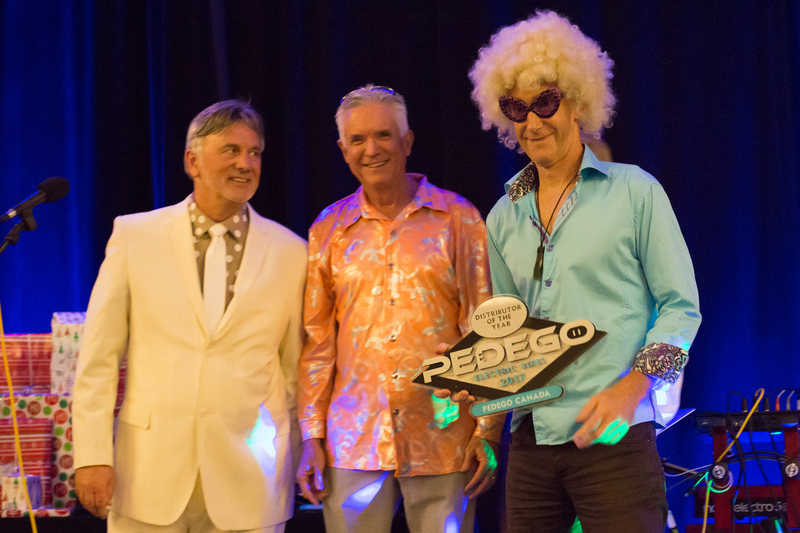 More than 200 attendees were present at the recent Pedego Electric Bikes dealer meeting in Fountain Valley, California, and Pedego Canada was honoured to be recognized at the event as distributor of the year with the most international sales. Aside from Pedego Canada winning distributor of the year, we were also excited to learn Pedego Victoria was one of the top dealers of the year by sales volume. 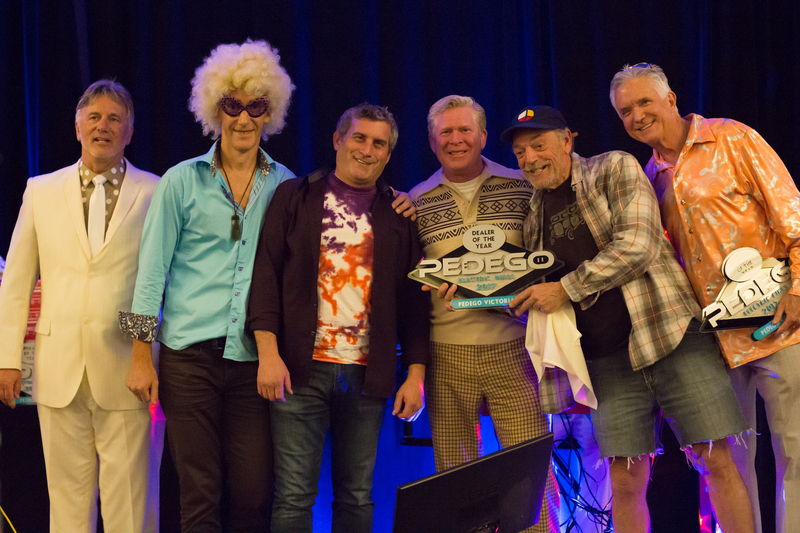 Sam Baio (in hat) and Charles Turner (in tie-dye) of Pedego Victoria accept their Dealer of the Year award. Pedego Corona Del Mar in California. Here are some more photos from the fun evening event.